Virginia’s state bird is the cardinal. The state tree is the dogwood. If there were such a thing as the state soup, it would surely be peanut. Here, courtesy of the Boar’s Head Resort in Charlottesville, is one of the best versions of this dish we’ve ever tasted. It’s perfect for chasing away the nippy chill of winter in the Piedmont. Enjoy! Heat stockpot over high heat and add peanut oil. When oil begins to smoke carefully add carrots, onions, celery and garlic. Sauté until vegetables become tender, approximately eight minutes. To the sautéed vegetables add the water, coconut milk, tomato juice, sweet chili sauce, and cubed sweet potatoes. Bring to a boil, reduce heat, and simmer until potatoes are very tender, approximately 30 minutes. Once potatoes are tender, add peanut butter and adjust seasoning as desired. 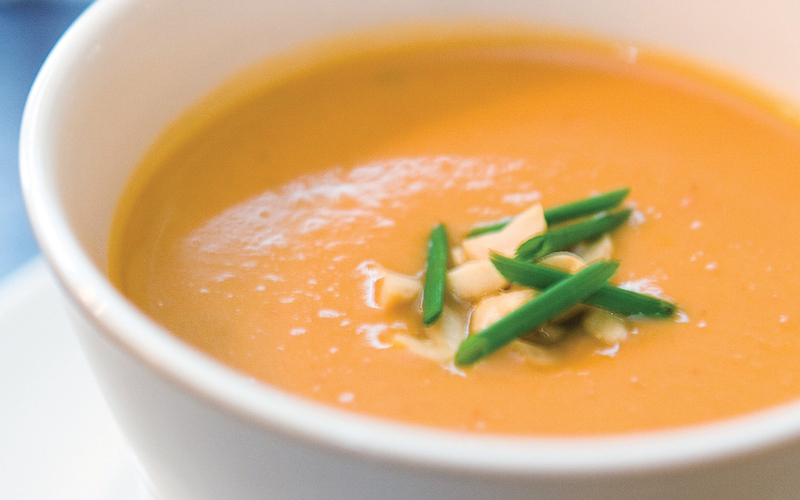 Carefully place small quantities of the soup in a blender and purée until very smooth. Strain through fine china cap and repeat this process until all the soup has been puréed. When serving, garnish with chopped scallions and roasted Virginia peanuts.